If you ever clicked on this URL before, you may recall a fairly staid page with contact information and company description. Now, however, you've not only got yer contact info and yer special title offers and yer bookseller terms -- standard company stuff -- BUT you've also got archived back issues of The BookStream Current, and book recommendations from Ken Abramson (reader extraordinaire) and Carol Chittenden (children's book reader extraordinaire), AND info on upcoming events like TitleWave and KidSplash. 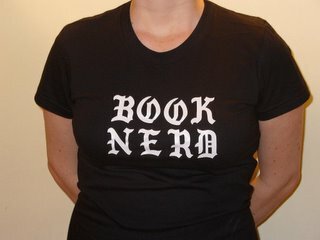 AND -- coolest of all for fellow bloggers -- the aforementioned fabulous Carolyn is posting juicy tidbits of Book News every day, especially that of interest to indie booksellers. How's that for link love? The idea of this website was to combine the best of what a blog does, and the best of what a book wholesaler does: that is, become a conduit for information. Wholesaler gets books from publisher to bookstore; blog gets information from other sources to readers. And in both cases, it can go both ways. I love that BookStream is creating itself as an intermediary in more ways than one. And even when I'm not involved in creating content for the site, I'm going to be checking (and commenting!) regularly to see what Carolyn, Ken, Jack & Co. are bringing to the table from the world of books. Take a look, and share the love!